MANILA, Philippines - The official results, list of passers, top examinees and other important announcements for April 2018 Civil Service Exam - Pen and Paper Test (CSE-PPT) conducted for government employees both for professional and subprofessional levels are released by the Civil Service Commission (CSC) few weeks after the eligibility examinations. 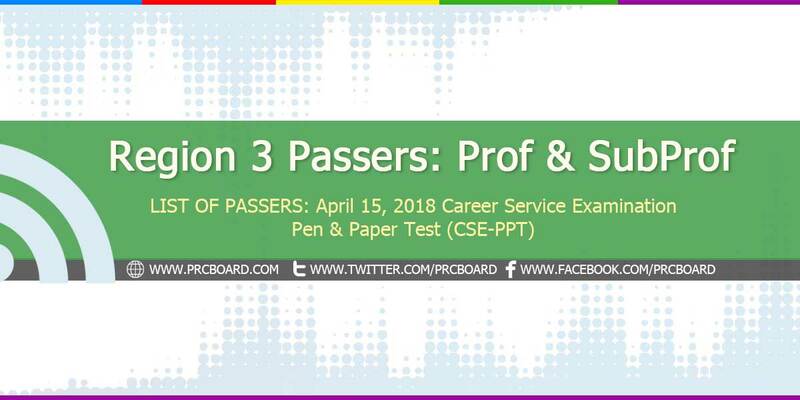 Below is the complete list of passers for April 2018 CSE-PPT Professional and Subprofessional Levels in Region 3 (Central Luzon). Iba pa po ba yung result nung exam ng March 18, 2018 at April 15, 2018? Yes, kasi magkaiba yung exam ng March 18, 2018 at April 15, 2018. Sabi kasi nung napag applyan namin para sa exam slot isasabay daw yung result ng April 15, 2018 sa exam result ng March 18, 2018. 60 days din yata release date nito. Marerelease ba this week yung result? Tagal Two Months na bukas wala paren. MAY BALAK PA BA KAYO MAGRELEASE NG RESULTS?? ?